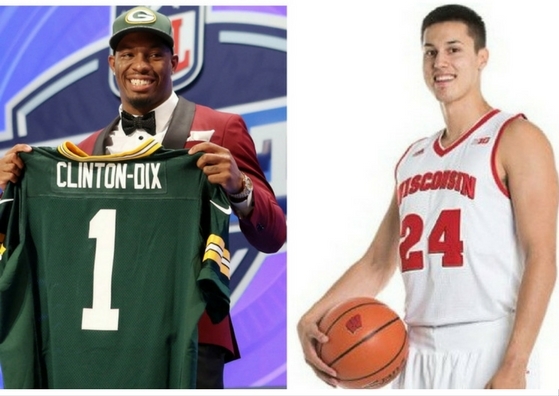 In recent weeks, two athletes of Wisconsin teams, one pro one college, have taken very different actions to show support for the rights of their people. Both of these stories are now 'old' as it concerns news cycles, a few weeks having passed, but they both remain relevant to the state of the nation. Packers Ha Ha Clinton-Dix decided to pursue a degree in Criminal Science to try to resolve the issues between police and the black community and Badgers basketball player Bronson Koenig went to North Dakota to join in on Native American protests of the Dakota Access oil pipeline. They may seem like near polar opposites of decisions: one within and the other on the edge of law, one in the confines of college and the other publicly protesting; but both are attempts to understand and help things happening to their people: African and Native Americans respectively. Both also are for the most part avoiding their 'celebrity' rather than trying to take advantage of it though their actions are public due to it. Clinton-Dix is one of many men in professional sports who, though we often think use college just to get to the pros, go back to finish their degrees once settles in their sport of choice (you may have seen the Larry Fitzgerald/University of Phoenix commercials recently.) They may do it just to do it - the sense of accomplishment especially for many men who may be the first in their family to do so - or to learn a skill for a career after their playing career (even if its 'just' in broadcasting). But Ha Ha is doing it for a very specific reason: to help learn about and resolve the growing animosity between people of color and law enforcement. His focus is on making police less feared and hated by his community: “I went into criminal justice because I want to learn more about the law, about what’s going on in this world, and be a mentor to kids from where I’m from," Clinton-Dix explained. "To [help them] understand that the law isn’t against you, it’s actually for you. Koenig has grown into a position of being a Native American rights advocate and role model, being a member of the Ho-Chunk Nation and one of 42 Division 1 NCAA basketball players who identify as Native American, side-by-side with his growth as a basketball player and young man. From promoting a healthy lifestyle (Diabetes is high among Native Americans) to pursuing education and other social factors, Koenig is becoming a role model and inspiration for Native American youth. With his latest action, he amps up his support of Native Americans to their very rights, their lands, and the fact that the pipeline could (would) impact their drinking water and sacred burial sites. It is great to see two local athletes take such admirable steps to doing the right thing, the right way. At a time when we are having discussions about the proper way to protest (on and off the field), the rights of people based on their race, and other issues with racial discrimination, these two young men at the beginnings of their careers and lives are showing they are truly Great Men and gentlemen with promise.